SHAWNEE, Okla. (AP) – Land that was used as collateral for a loan to now-closed St. Gregory’s University in Shawnee is back in the hands of St. Gregory’s Abbey. Ownership of the land came into question when the university filed for bankruptcy in December 2017. St. Gregory’s abbot, the Rev. Lawrence Stasyszen, told The Oklahoman that creditors were satisfied with the proceeds from the sale of university property and its assets. The monks are now donating some of the land to the nonprofit National Institute on Developmental Delays. The institute for children and adults with special needs was started at the university in the 1960s. The monks also donated $60,000 to the institute, which will build a new home for its programs on the donated land. 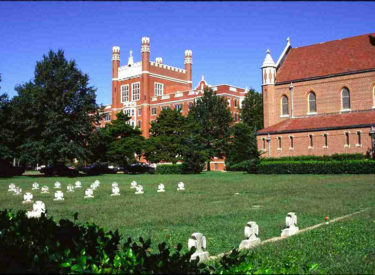 St. Gregory’s was founded in 1875 and was the only Roman Catholic university in Oklahoma when it closed in 2017.